This issue came up on our own internal accounts machine, so it was pretty critical to get it resolved. Seemingly out of the blue, the machine decided to stop backing up. 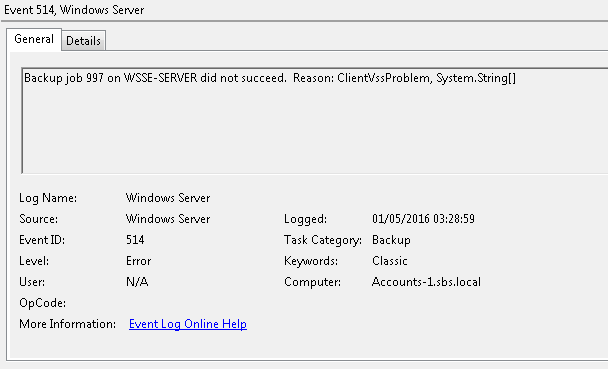 There was nothing particularly helpful in the logs on the Essentials Server. Checking the logs on the client itself revealed a string of VSS related errors. I decided to abandon the Client PC backup at this point, because if the underlying cause was VSS, then what we need to do was fix VSS and then this would also fix the client backups. I tried to create a system restore point, but this failed with a number of different errors. The most common of which was 0x8004230f. Along side these errors were NTFS and Disk warnings that led me down a rabbit hole of checking Volume GUIDs, DISK IDs and things that were ultimately unrelated to the cause of my issue. I had already tried CHKDSK and looking at permissions on COM+ Objects, nothing helped so I enlisted Microsoft CSS to assist in troubleshooting this issue, primarily because I could find no solution to an issue that a quick search shows affects many people, secondly because I really did need to solve it and reinstalling was not something I wanted to do. We spent quite some time installing hotfixes, running CHKDSKs using Process Monitor. Eventually i was directed to do a ‘Repair Install’ which on Windows 7 involves running Setup.exe from the Windows 7 media from within Windows, (side note, make sure if you do that you reinstall all updates and SPs afterwards). This still did not bring the machine back to a working state. In the end a CSS Escalation engineer ran the following command. Evidently at some point the client had done some sort of Hibernation and failed to resume correctly or some event of similar nature which affected the VSS Service.